The art I buy always reflects something that I care about. 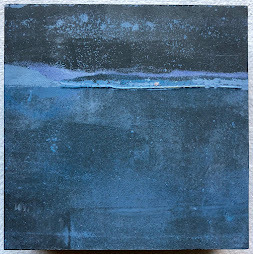 I always try to make contact with the artist, either in person or online, because I want to have a personal connection to the artist, what they create, and what I hang on my walls. Mostly I find that what I purchase I fall in love with immediately because it speaks to me. 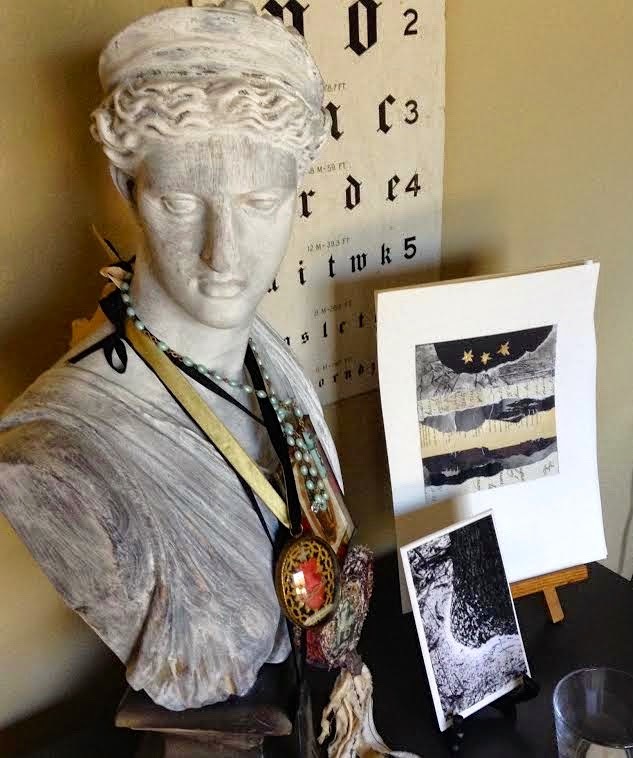 A tie to the past and an appreciation of the present; everything I hang as "art" has a personal connection (an exhibit I attended, art by friends, a piece purchased or given in connection with some occasion and even some of my own art). It is not a stagnant arrangement but changes according to my mood and inclination but always reflecting color, texture, pattern and tone. 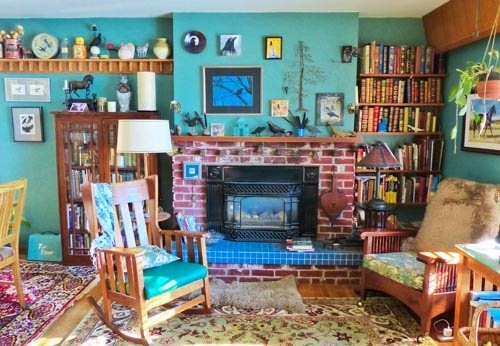 This photo features the crow and raven shrine over the fireplace. I am quite obsessed with these birds and collect their images. 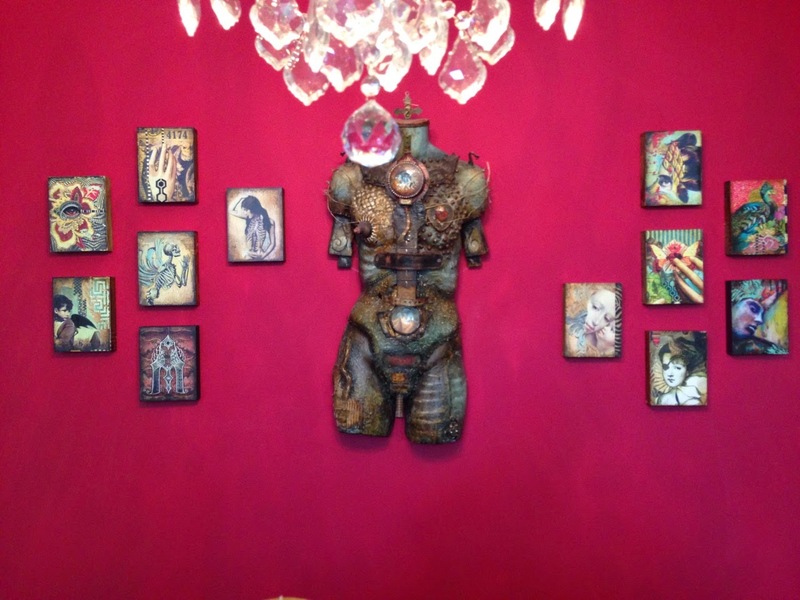 The "shrine" features themed works in various media. Some are my own works, others are gifts from family members or works that I have purchased from other artists. The blue glass holds a collection of gifts from the neighborhood crows, gathered during summer dog walks. I strive for an understated elegance in my own work and surroundings. I want to live with art that reveals itself over time - which I never get tired of seeing. Self indulgent! 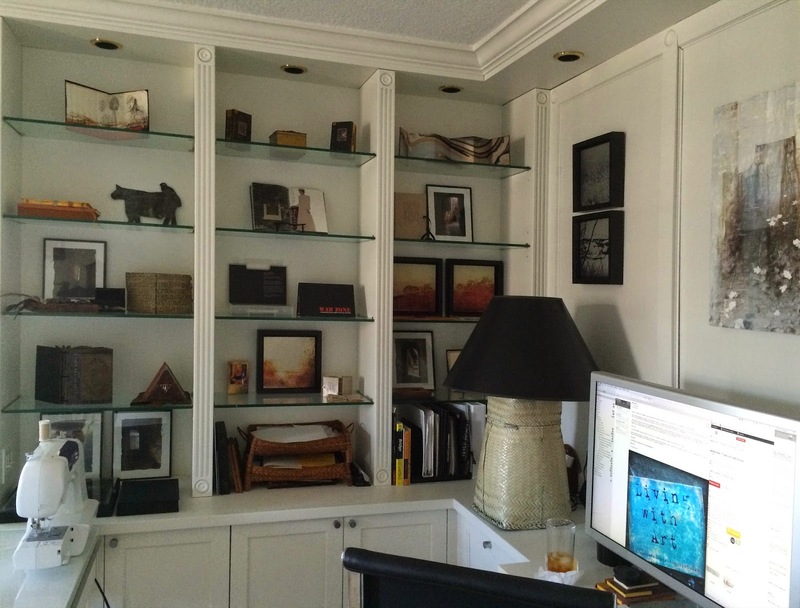 I surround myself with work I love and that sparks my imagination and eclectic creative longings. 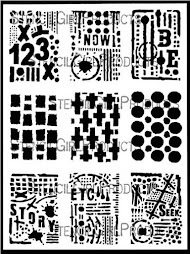 This may be folk art, contemporary art...my art, friend's art...lots of my daughter's art, the only thing I am really lacking is that hidden unknown space I stumble upon in my dreams. That place to put MORE art. 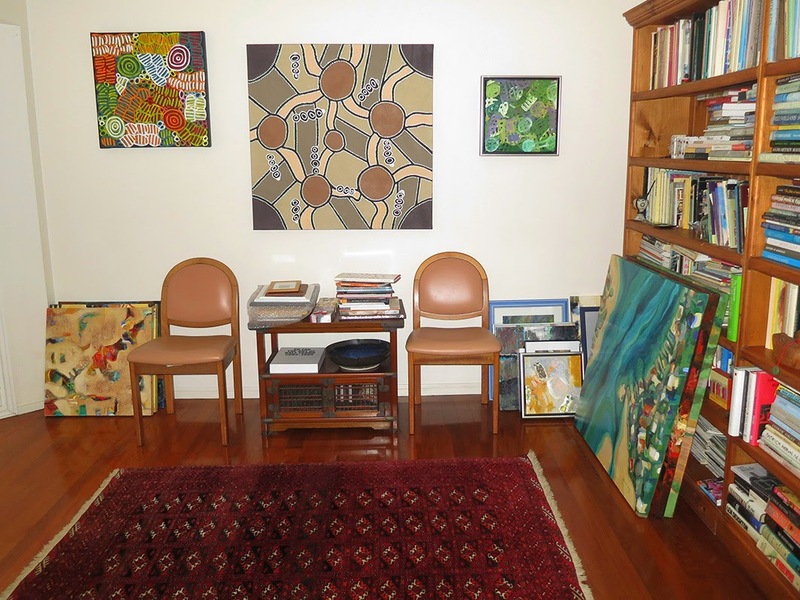 I am eclectic collector of art, tho' I lean toward Australian artists. The work of Aboriginal artists is unique and usually has a story that is a part of their culture. This always reminds me that art is part of who you are, and where you sit in context of the history of the world. I like to surround myself with color and light - life is dark enough. 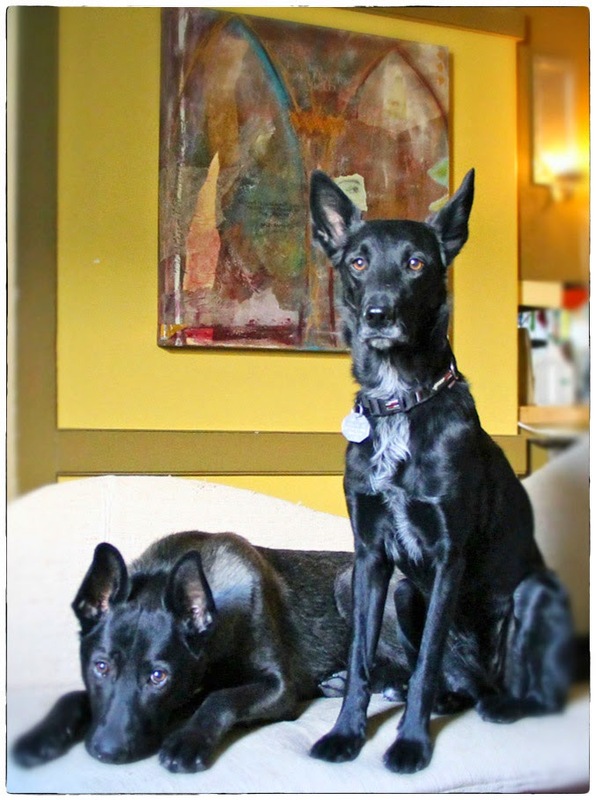 The art in my home, whether mine, or artists I admire, fills me with inspiration and joy. 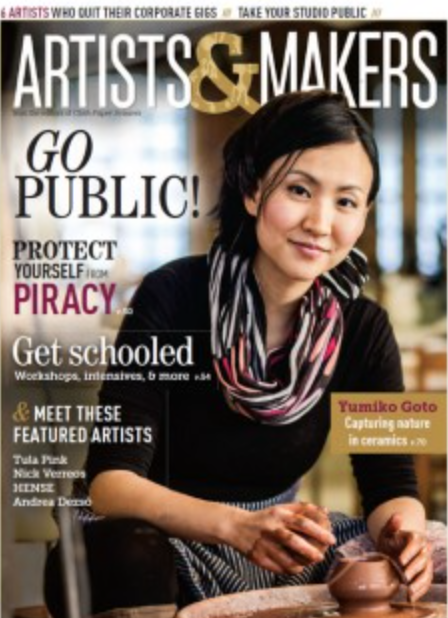 Last November, a new print magazine from Interweave called Artists & Makers was released. It seamlessly blends creativity with business and contains topical and useful articles about every aspect of being a working artist. 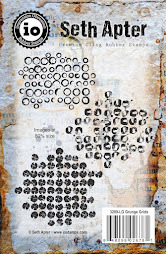 The editor, Jeannine Stein, shared her thoughts with me about the publication in a previous blog post here. The second issue has just been released and it looks every bit as good as issue one. Take a minute and have a look inside here. The beauty of abandoned buildings in NYC from Will Ellis. Paperology 101 - a truly informative lesson - from Blick. How cool is this chair - and the video that goes along with it - from Tjep. 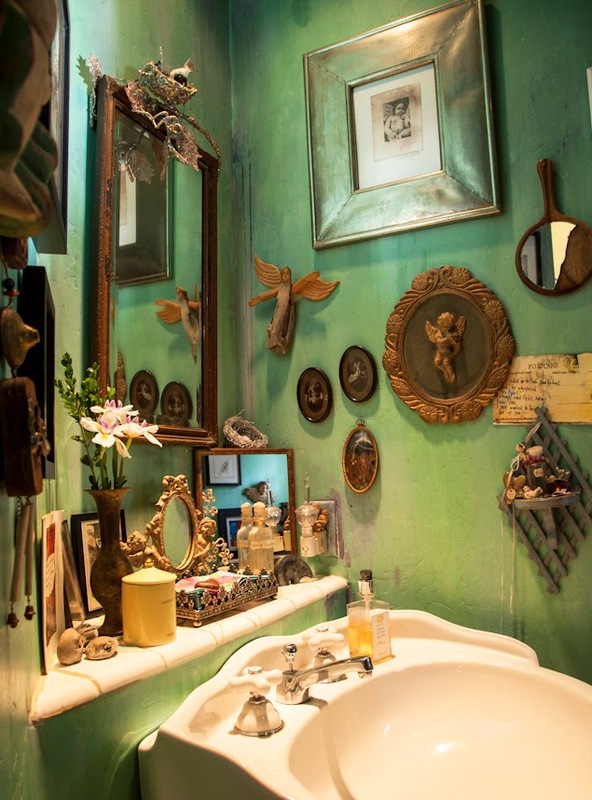 Magnificent Obsessions: the Artist as Collector. Wish I were in London for this one. Clever 3D illustrations using common objects by Victor Nunes on I Need a Guide. Powerful artwork that modernizes history by Titus Kaphar, also from I Need a Guide. Derek "Deek" Diedricksen builds one of his tiny houses inside The Empty Spaces Project gallery in Putnam, CT as part of a 3-day workshop. And you can sign up here. 99 top design and craft journalists, bloggers and media to follow on Twitter from The Design Trust. 100 fresh blogs and websites for creative professionals to follow in 2015 from Creative Boom. Those of you who have followed my blog for any length of time are likely to be familiar with The Pulse. 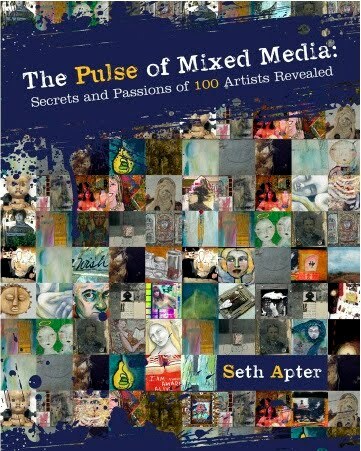 The Pulse is a collaborative experience that has been part of The Altered Page since January 2008. Its purpose has been to "tap into the pulse" of the online, art community. With so many talented and creative artists to follow, I thought it would be fun, informative, and inspiring to bring them together through a varied series of ongoing projects. Since the very beginning, The Pulse has taken on a life of its own. It began as a blog project with five online editions, all of which can be accessed from my sidebar. Over 130 creatives participated in the most recent version. From there it morphed onto paper, first as a limited edition zine and next as the basis for my two books published by North Light: The Pulse of Mixed Media and The Mixed Media Artist. The project has been featured in magazines and independent zines. And along the way, there have been a series of live panels featuring artists from the book -- from New York to Colorado to Arizona. 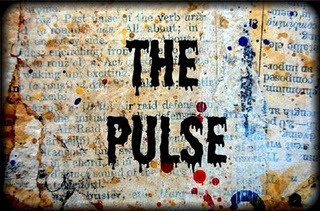 And now, I am thrilled to announce that The Pulse is about to become a live exhibition. 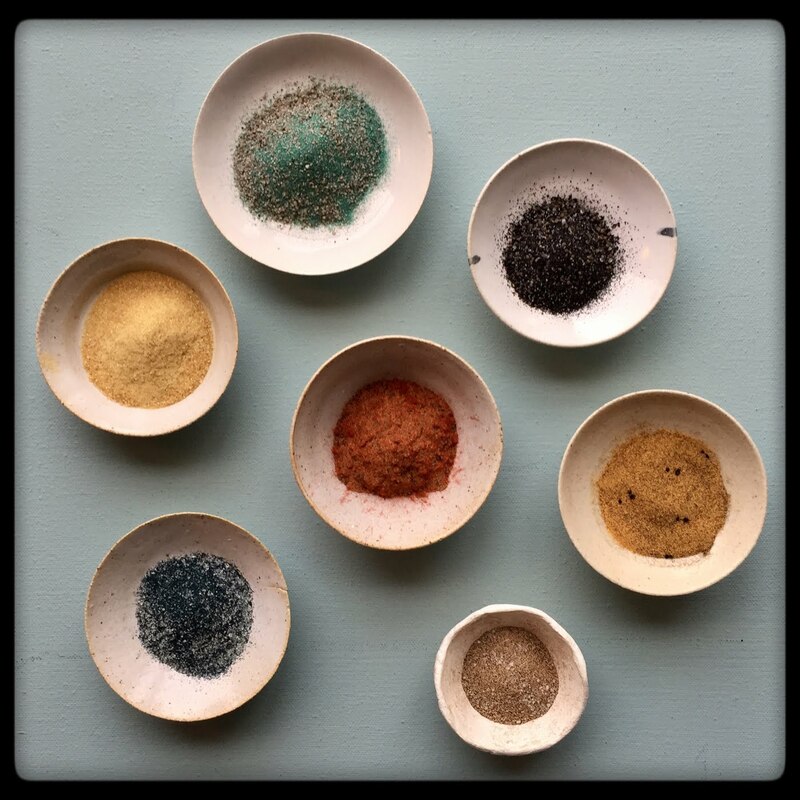 The Pulse Project will take place at The Empty Spaces Project gallery in Putnam, Connecticut during the entire month of April 2015. Run by Paul Toussaint and Ann Monteiro, this was the space that recently hosted the 5 x 5 Small Works exhibition, also based on The Pulse. Over 25 artists that were featured in my books are exhibiting their work at the show. I will be announcing the list of artists in the coming days. 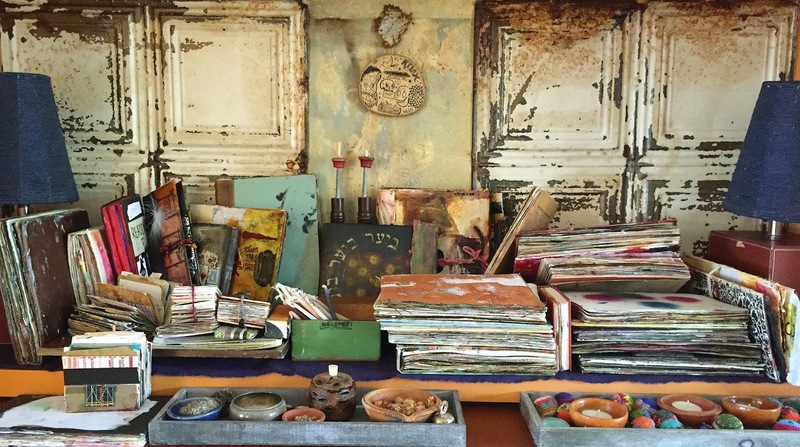 The exhibited pieces reflect the full range of mixed media and include assemblage, encaustic, collage, acrylic, oil, pastel, photography, digital, fabric, jewelry and more. A number of the works were featured in the books although the majority are new. For those of you in the area, the opening reception is being held on Friday, April 3 from 6-9pm at the gallery located on 114 Main Street in Putnam, Connecticut. There will be a number of artists from the show attending. The show officially closes on April 30. I would never leave out those of you who are too far to attend however! There will be a virtual gallery on my blog for the run of the show with images, details, links, and prices for all the artwork in the exhibition. And I will of course be posting many images from the exhibition on all my sites. After all, I want everybody to be able to keep their finger on The Pulse! Seriously the best thing to happen to coffee rings. Ever. Everything glue. Kelly Kilmer shares helpful tips and all her favorites. 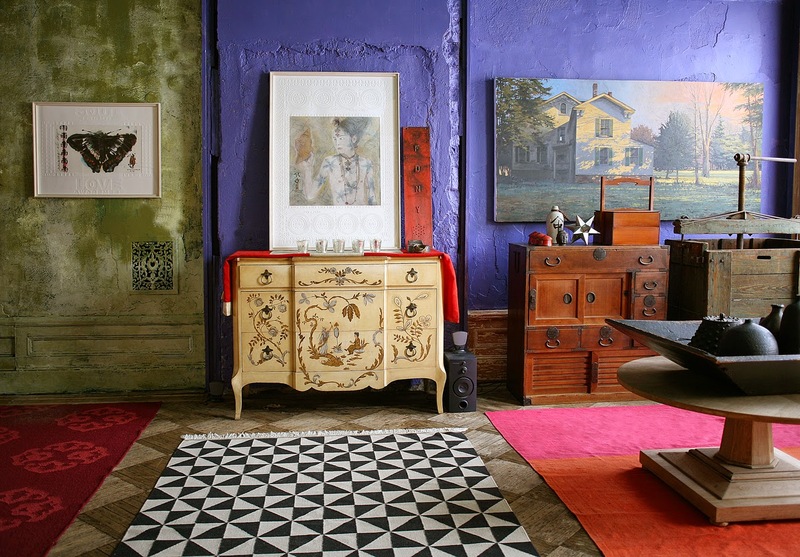 What's new with color trends from Miriam Schulman. And speaking of color...Dina Wakley talks color wheel and gives some helpful color tips. Book artist and surgeon Brian Dettmer gives a TED talk. Thanks to Jennifer Coyne Qudeen for sourcing this out. 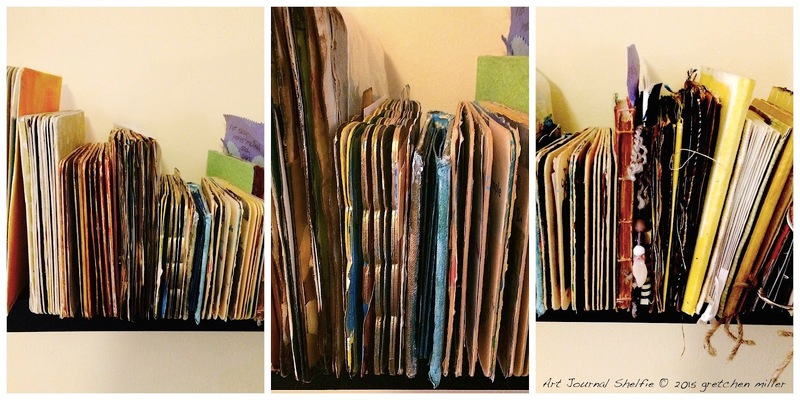 And speaking of Jennifer...she reviews in 5 posts (1, 2, 3, 4, 5) her recent visit to the Yale University Art Gallery to see Odd Volumes -- what looks to be the most cool book arts show in history! And speaking of books...check out this amazing industrial book cover from Finnabair. There is a tutorial too. Domain Home has recently posted a list of their 15 favorite interior design blogs. Growing up in the Suburbs of Washington, DC, I lived in a classic Federal Brick Colonial house where all the walls were varying shades of white. In 1992, I bought a home in Brooklyn, NY that had been boarded up and vacant for over 10 years. Friends have called it the Adam's Family house, but for me, my home represents the opportunity to express my true love, color. 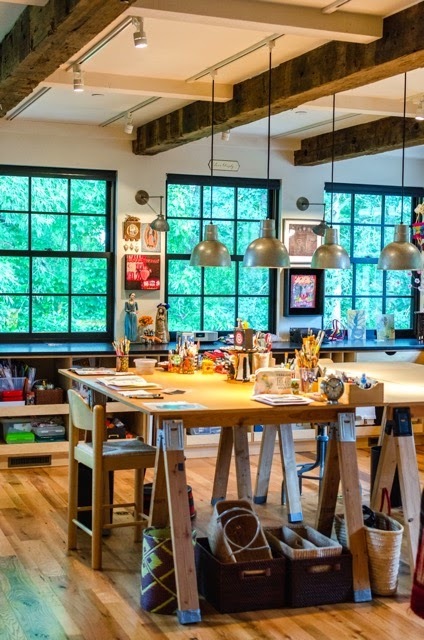 Our space is a combination of the art we create on our travels, art gifted to us by talented friends, and the vast array of art that simply comes with having four generations of artists in one family. Some walls literally feel like a revolving gallery show with new work moving in and old work moving on. I need to see art everyday...art on the walls, in a vase, on a plate, on a face... it doesn't matter where or how, I just need it to breathe... or I get very cranky indeed. I am drawn to art with a sense of mystery or the unexpected. Art that captures the texture and layering of the paint, the relationship between color and drawing, and the story between painter and painting. 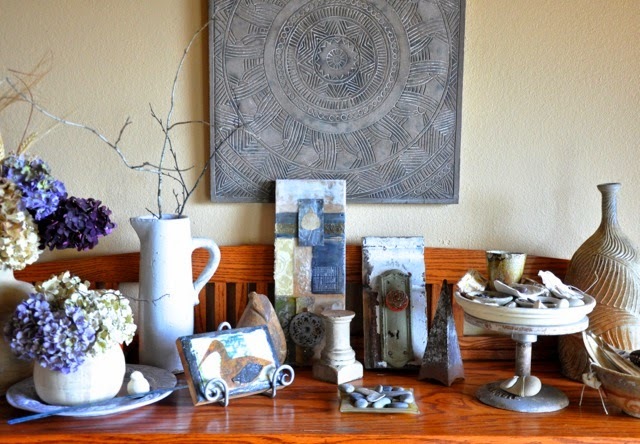 In my studio, I surround myself with art I love, mine and other peoples that I have collected over the years. No rules, just what I love...a collected aesthetic. 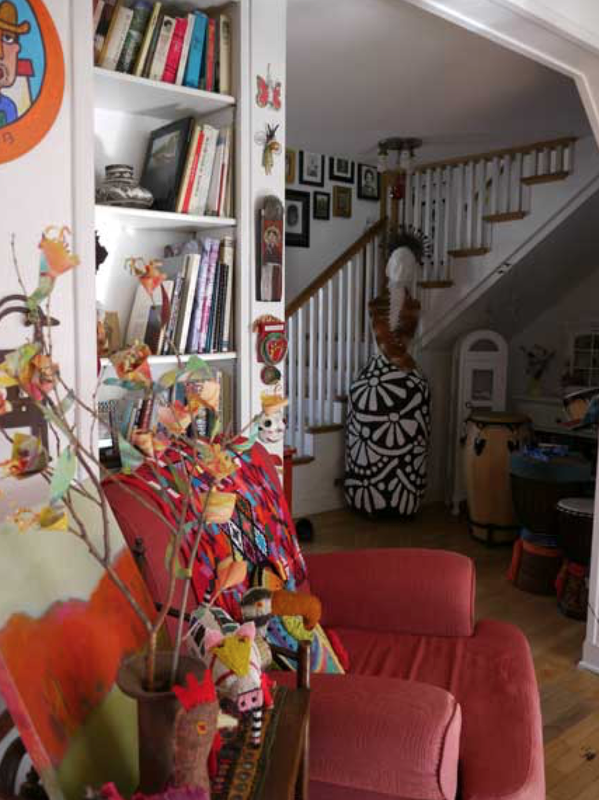 My home is typically decorated in earth tones...rich green, brown and blue...so that the art I am attracted to (and create) tends to stand out quite vibrantly in orange, red, turquoise, and is filled with meaning. The art I am drawn to has been created by friends or artists I have met and I know the story behind it. An artist friend once commented on a photo I posted on FB, "do you live in your paintings?" Upon reflection I realize that my inner world brims with a beauty that cannot be contained, but overflows into my surroundings bringing loveliness in many forms. can't get enough of them.